1. In cast iron cast skillet, heat olive oil over medium high heat. 2. Add ground turkey and garlic. Stir occasionally and cook for about 10 minutes. 3. Add onions and yellow peppers and cook until onions are gold brown. 4. Add the sweet potato, chili pepper, salt and pepper. 5. Cover the skillet and cook until they are tender. Don’t forget to stir occasionally. If necessary, add more olive oil or a little bit of water to cook the sweet potato. 6. While the sweet potato is cooking pre-heat the oven to 400 degrees. 7. 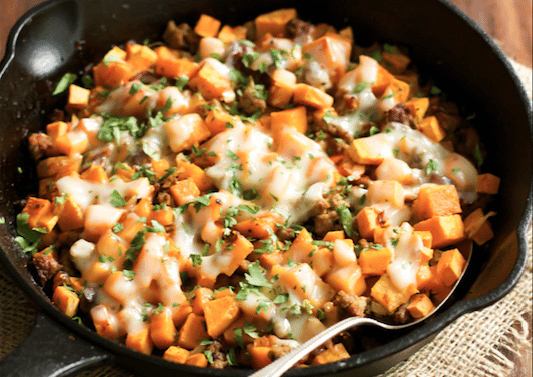 When the sweet potato is tender, add shredded mozzarella cheese and bring the skillet to the oven to melt the cheese. 8. When the cheese melts, remove from the oven and garnish with parsley.